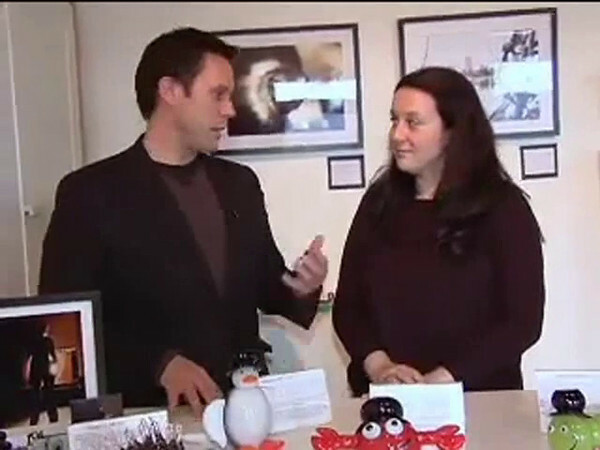 Media Appearances - Occasionally I've been honoured with the opportunity the showcase my work to a larger audience, such as through film, television or print. The purpose of this gallery is to, where permitted, display these pieces in a single location to give you the opportunity to see my work and studio in ways which the rest of the website does not allow. Thank you so much for those who have featured me in this way, and only those pieces for which I've gotten permission to share are on display here. I hope you enjoy them! 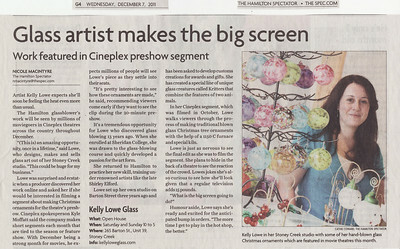 Newspaper Article: "Glass artist makes the big screen" Newspaper: The Hamilton Spectator Article Focus: Cineplex Entertainment pre-show film I appeared in Date: December 7th, 2011 The Hamilton Spectator is one of Canada's largest newspapers, with a weekly circulation of well over half a million. 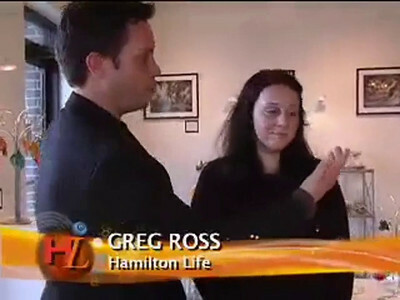 In my opinion they are a great supporter of the local art scene, and this article here is a perfect example of this commitment: when Cineplex Entertainment filmed a pre-film segment starring yours truly demonstrating how I make traditional blown glass Christmas ornaments, the Hamilton Spectator was there to graciously cover the event and spread the word to their readers. I'm a tad bit on the shy side and get nervous whenever I have to stand in a spotlight, but working with professionals such as Nicole Macintyre (the writer) and Cathie Coward (the photographer) made this whole experience incredibly easy, and fun. Thank you to them both, and to the Spectator for their ongoing support of local artists! To view the newspaper's online version of this article please click the following link: Glass Artist Makes the Big Screen (opens in a new window). Newspaper Article: "Tops in Tourism" Newspaper: The Hamilton Spectator Article Focus: The Spectator's coverage of Hamilton's 2012 Tourism Awards, at which I was recognized as the Arts Ambassador of the Year Date: March 7th, 2012 The Hamilton Spectator is one of Canada's largest newspapers with a weekly circulation of well over half a million. A nice two page spread on Hamilton's 2012 Tourism Awards. It was an honour just to attend this event with so many of the people that make Hamilton a fantastic city to both live and do business in, and it was very exciting watching them being recognized for all their hard work. Being nominated as the Arts Ambassador of the Year was a huge thrill on its own, and winning was definitely one for my own personal highlight reel. Thank you to everyone involved, and congratulations to all who took home a fabulous piece of glass art by a certain Hamilton glassblower! To view the newspaper's online version of this article please click the following link: Food Truck, Downtown Festival Big Winners at Tourism Awards (opens in a new window). Newspaper Article: "Glassblower Recognized as City's Arts Ambassador" Newspaper: Stoney Creek News Article Focus: My being selected as the Hamilton Arts Ambassador of the Year by Tourism Hamilton Date: March 15th, 2012 The Stoney Creek News is a local Community newspaper that has served the Stoney Creek area of Hamilton-Wentworth, Ontario since 1948. A very pleasant surprise this year was being nominated for, and winning, the Arts Ambassador of the Year Award from Tourism Hamilton. Another pleasant surprise was being contacted in the days following by Abigail Cukier, who was interested in doing a story about me for her newspaper, the Stoney Creek News. It was an honour to work with Abigail, and they even let me sneak in a picture of my newest type of glass angel to boot! To view the newspaper's online version of this article please click the following link: Glassblower Recognized as City's Arts Ambassador (opens in a new window).